Why? Because, for most of my life I’ve tried to master and control my experience. Trusting life and knowing how to relax into the unknown were things I gave good lip service, but knew little about in reality. LIfe continues to heap lesson-upon-lesson in this regard. In response to experiences asking me to “let go”, I’ve usually answered by whining. That is, until I’ve remembered that life has a tendency to repeatedly serve up lessons that can vastly improve life. They aren’t meant to make life miserable. For me, ignoring the lesson “relax into the unknown” is what resulted in pain, unhappiness, and exhaustion. Moving to Italy requires an enormous amount of thinking, planning and doing. I realize how fortunate I am now that I’m clearly on the other side of all that up-front stuff. You know, getting the elective residency visa, closing up “shop” (job and home) and getting my permesso di soggiorno and residency. The list goes on. I share this because, if you’re about to do the same, or are in the process, you’ll understand how easy it can be to get stuck in high gear. And when it comes finally to downshifting, you may find yourself mired in hypervigilance. That’s pretty much what happened to me. I’d landed in this amazing country but my mind still was scanning the horizon asking “What next?”. It’s taken me a few years but I’ve been settling down. But that’s only because I started learning how to relax into the unknown. Learning to relax has broad application and benefit. The lesson as it applied to moving to Italy was loud and clear. And then I realized I had an opportunity to do this on a grander scale. That’s when a huge realization emerged. I’ve been attempting to control and orchestrate my experience of “what is” for most of my life. And I stink at it. I’ve tried to create a world and an immediate environment that fit with preconceived ideas of what reflects professional and personal success and what makes me feel good. The key phrase is “preconceived ideas”, meaning all that I had been taught through school, church, society and the media. We don’t give much weight to the world beyond our understanding. We aren’t taught how to trust the unknown. You might think I’ve gone around the bend with this next part but bear with me. I’m normally not a fan of Disney World. Yeah, heresy, right? The first time I went, the experience fell incredibly flat. Why? Because it all felt manufactured and artificial, a sanitized idea of happiness. Only when I metaphorically slapped myself and embraced complete escapism did my mood change and I began to enjoy myself. Kind of like allowing yourself to enjoy that huge wad of cotton candy and making peace with the sugar withdrawal later. This experience taught me I wasn’t keen on a world of manufactured happiness. It just didn’t smell or feel right. Ironically, this experience has come back to tell me I’ve been trying desperately to create Jed’s personal Disney World. Use imagination, and envision the life you want, but then get out of the way and let the unknown happen. I’ve learned this is where things can get really interesting and really exciting. I’m a big believer in having a vision and richly coloring that picture with ideas. But If I get so fixated, so insistent on how it all needs to play out, I can be missing out on the good stuff. How many times have I thrown inner and outer temper tantrums because things aren’t unfolding in The World According to Jed? Plenty. Trying to control one’s experience is exhausting and impossible. Of course, we all have the choice to how to respond to what shows up in life. But trying to be master of the universe is a recipe for disaster. I believe this is partially what the Buddhists talk about when they refer to clinging and attachment. I know that I, all too often, cling to my ideas of how things are supposed to be. I also hear the voice of my ego threatening me that everything will come flying apart if I don’t stay at the helm. “Let go of control and you’ll be sorry.” That’s what I hear. But that’s a lie. The absurdity of taking on the entirety of life in one fell swoop. I’ve become well-acquainted with the utter futility of this endeavor, yet I still find myself trying to take it all on. If anyone has figured out doing this with any amount of success or peace, believe me, I’m all ears. I no longer can spend time locked in a mental analysis of the past while simultaneously using it as a filter to anticipate, predict and plan for the future. When I’ve done that I’m not in the here and now. That’s like traveling through life trapped in a capsule of thinking and labeling everything in an attempt to exact control over life. How many times have I been so intent on translating what’s happening only to find out later I wasn’t even “there” for the full, tangible experience? Relax, relax, relax…and take it one day at a time. I know this sounds incredibly trite. When my sisters and I were unruly young tyrants we loved making fun of country music lyrics, and of particular ridicule was Cristy Lane’s “One Day at a Time (Sweet Jesus)”. Well, I’m singing along now (minus the heavy twang). What a relief to live without being in a constant state of readiness and without trying to micromanage everything for the rest of my life. Yes, planning and doing still have their places, but they don’t rule my life. And herein lies the great paradox. The less you try to take on, the less you try to control and to exert power over your experiences, the more power shows up. And that’s when really cool stuff starts to happen. Another wonderful post Jed! I really enjoy this type of subject….the shared insights and the deeper perspectives that relate to our lives. This is yet another post that brings together much of what I think about on a daily basis. I am pretty centered between emotion and logic…with logic wearing the proverbial “pants” in the relationship. As I move myself mentally towards the next chapter of life, and a possible move to Italy, I truly don’t know what to expect. This comes from the ever increasing realization that I am not in control. This lack of control is a two sided coin. It can indeed be freeing….but it can also give you the feeling that all planning is futile. And then a constant battle ensues. I’m less and less sure of life as I reluctantly let go of what has been a set of firmly defined hopes and dreams. I can’t help but think of how hopes, dreams and material things could be more correctly defined as the potential obstacles to true happiness. We can plan…but it’s truly not up to us. I’ve come to a place where I’m not sure of the move….or if it will bring happiness. It’s a subject way larger than this post allows. But….I wonder if the follow-through towards a life in Italy is not at the very least a nice experiment. Insert lab rat (me) into the maze (Italy) see what really happens. Perhaps I’ll learn that I want to go back home? Perhaps I’ll learn that my original thoughts were more correct than anticipated? But…I have a feeling that I won’t truly be happy if I approach it in any other way than to just “relax into the unknown”. One of my favorite movie quotes…sorry can’t remember the movie….but is as follows: “Control is an illusion” We are never truly in control….we just build elaborate story lines that allow us to believe this is the case. Point yourself in the direction you think you want to travel…accept life as it comes…realize you’re not in control… and “relax into the unknown”. Cheers! Hi Kevin, I so appreciate you adding so richly to the conversation. Yes, in my experience “control is an illusion”. I also believe nothing is fixed––meaning there isn’t a predetermined “right” course in life. I’m a believer in making choices and then seeing where the river takes you. I can’t tell you the number of times I’ve been dead certain a direction I was taking was the right one, only to find out, by living the experience, that another direction, other options, were in order. 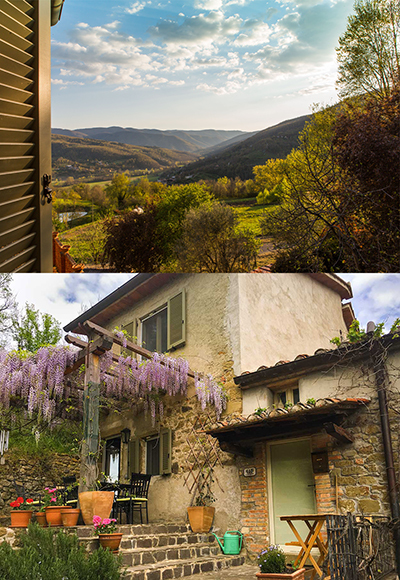 Even coming to Italy initially came with visions of residing peacefully in the remote hills of Umbria. I came to understand how important having space and quiet were to me, but I also came to realize I needed more regular exposure to the energy of a vibrant city like Treviso. I return often to Umbria but, looking back, I understand now I had to be open to letting my vision and experience change and unfold in a different direction. Some people move to Italy and then, after a few years, decide it didn’t deliver what they’d hoped, and they return “home”. Jon Kabat Zinn wrote, “Wherever You Go, There You Are”. I’ve certainly been learning the truth of that expression. Italy has cleared out many of the distractions and cobwebs of my conditioning and laid bare a clearer understanding of myself. It hasn’t always been easy, but I’m grateful for the unexpected lessons. Thanks for writing! Thanks for sharing some of your inner journey. As one who has taken a similar path, the psychological changes have been every bit as sweeping as planning and sorting out the material things that no longer served me. I found that “living from a deathbed perspective” was and continues to be extremely freeing. If I imagine looking down on my experience from my deathbed, what is important? What will this look like and how will it likely be valued by my kids if they are sorting out my things when I am gone? From this perspective, things like labeling and dating photographs, getting documents and papers and passwords organized are tasks that have significance. Getting rid of junk is a gift forced upon us when we leave for another country, and soon we realize how possessions possess and how freeing it is to live as if everything is temporary, for it truly is. Thank you for your beautifully articulated comments. I particularly harken to “living from a deathbed perspective”. I find it amazing how much more alert to the present I am when I take that perspective. And I hope to remember “how possessions posses.” Bravo!